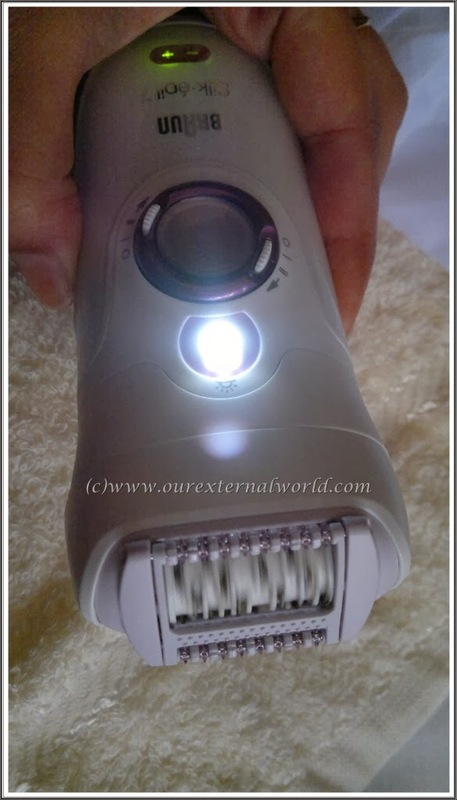 Hi friends, if you remember I did a post long back on a nifty little product to do facial hair removal at home. 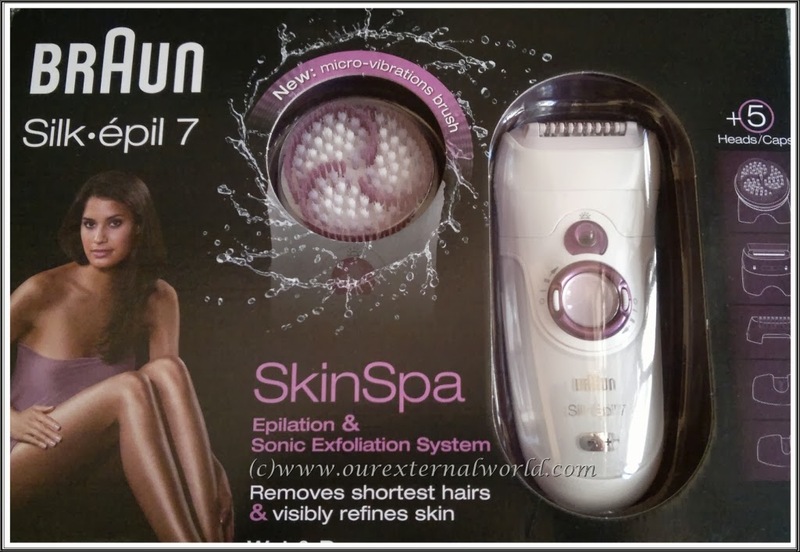 Today I am reviewing a product that you can use all over your body for easy hair removal. 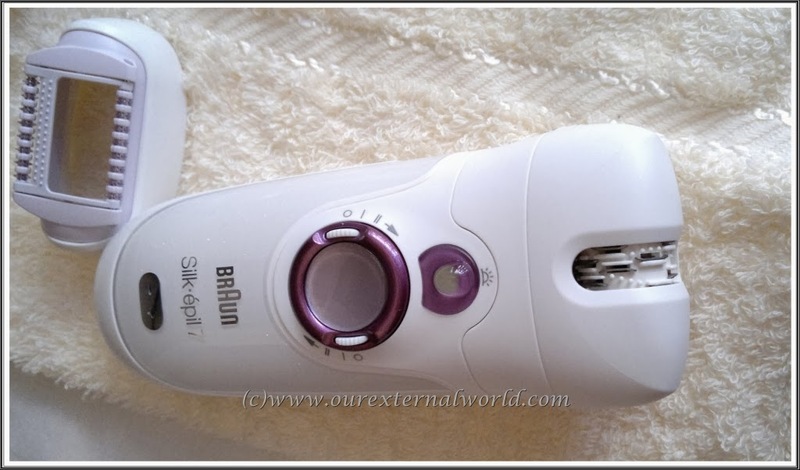 Braun's Silk Epil 7 Skin Spa (model 7951) is an epilator, shaver & spa all in one. This is a long post because there is just so much to talk about here. Its also picture heavy but I hope you will find this useful. I also have a comparison note where I talk about how this new Silk Epil 7 is different from the earlier Silk Epil that I've been using. For those of you who are new to epilation let me first explain a bit about the process. 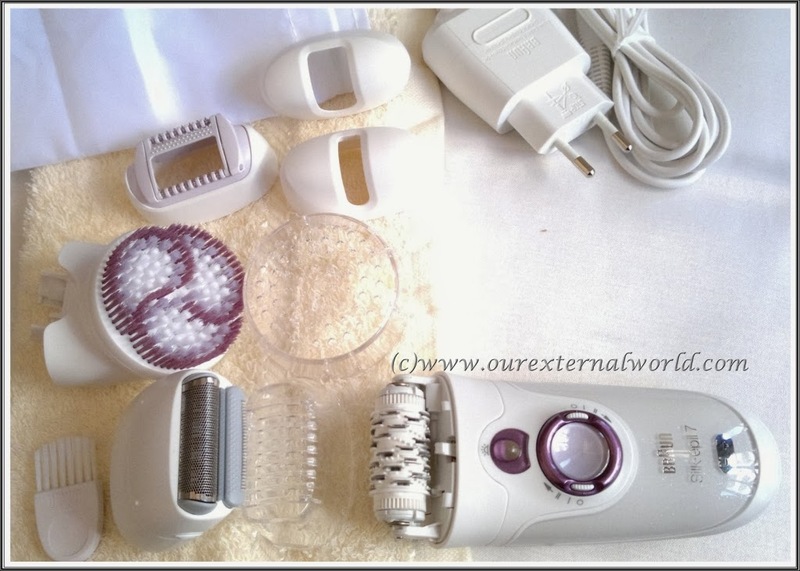 Basically epilation involves removal of hair from the roots by plucking it out using a machine called the epilator. Hair is removed from the roots hence the hair takes longer to grow back and over time the hair becomes thin and sparse. In these terms it is almost like waxing except there is no mess involved. For those of you who are used to waxing, the pain is similar or less (depending on your sensitivity) but the good part is while waxing doesn't work on small hair or during humid/rainy days, epilation works perfectly. 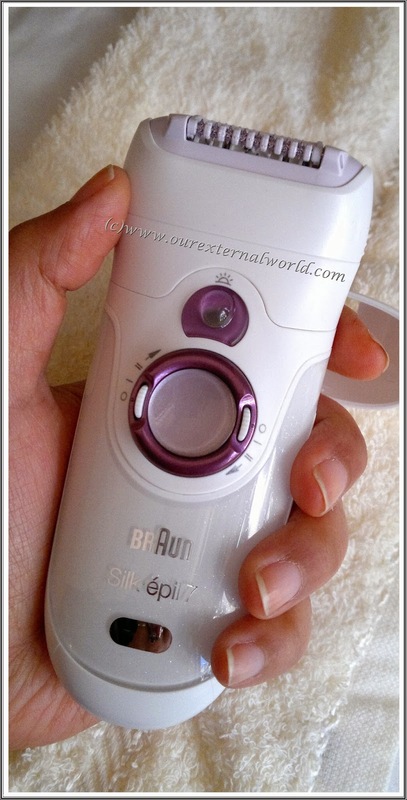 Now coming back to the Braun Silk Epil7 Skin Spa. This is the latest launch from Braun. The epilator and its accessories come nicely packed in a box which also contains a small cloth bag to store all the contents in safely. Silk Epil7 Skin Spa can be used both dry and wet (yes you can take it with you to the shower! ), and has a light to light up shorter hair which you would otherwise miss. The main body of the epilator is white and the area below the dial is all nice and sparkly. I love the use of white and purple throughout the product. 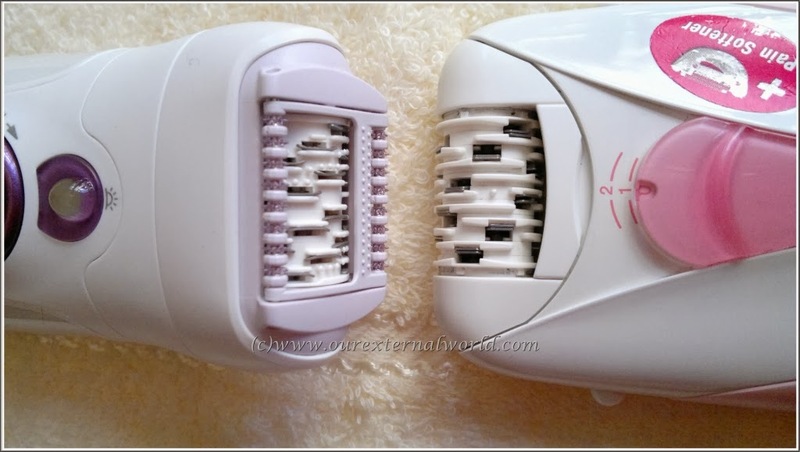 There are a total of 5 different heads that attach to the main epilator body. Each head is meant to be used for a specific purpose. The main head is of course the epilator head. 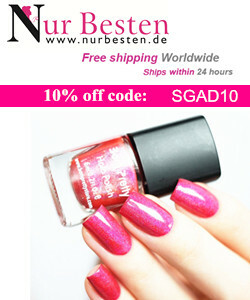 This has a sensitive skin attachment designed to help pull out short hair without causing any pain. This is the attachment you will be using most often. 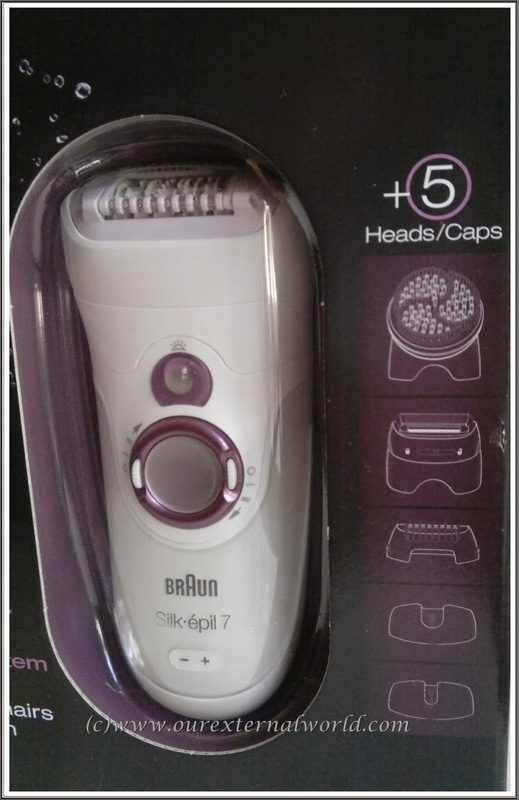 Next there is a shaving head, now why do you need this - well for starters if your hair is longer than 5 mm then you should clip it down to the optimal 5 mm length or use this shaver head to shave it off and then wait for it to grow back a bit before you do the epilation. This also comes in handy if you epilated but did not cover an area properly but realize that only a week later - so while rest of the area does not have hair you notice some in a small patch - simply shave it off so that you can do the epilation once for the entire area together. And finally the Spa head, this is a round head with soft plastic bristles attached to it. This head can be used for buffing away dead skin or used in the shower to apply your body wash and at the same time give your skin a nice polish! I think this is the best part - the Spa head, this little attachment works wonders. Use it in the shower and watch the lather build up. Its great to exfoliate your skin. One point to note here is that you should not exfoliate using this attachment on the same day as your epilation, give a gap of two days just like you would between exfoliation and waxing. I've been using an epilator for a long time so using this was breeze for me. For those of you using it for the first time do make sure you read the instruction guide that comes with the epilator which explains everything about usage and also about how to store your epilator so that it lasts you for years! 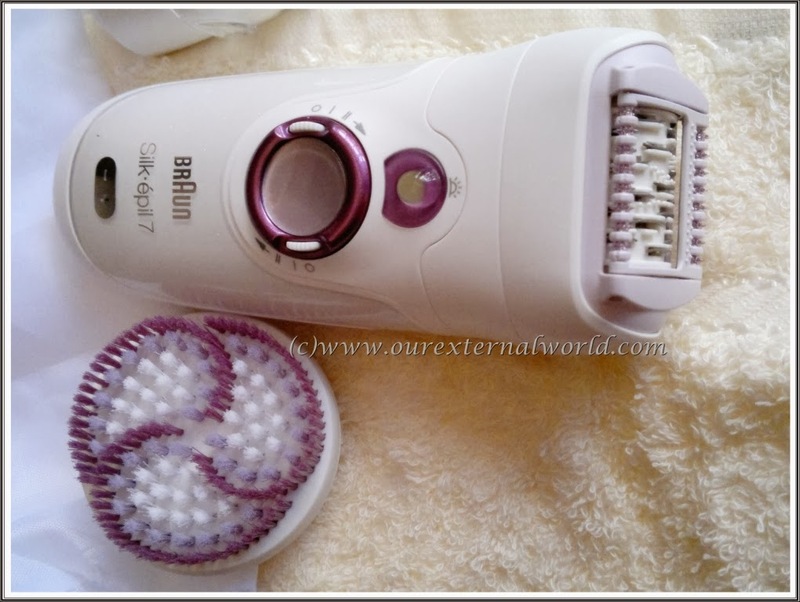 Now I have used Braun's Silk Epil older version called "eversoft deluxe" and have been very happy with my purchase. The older one I has lasted me over 10 years (yes that is true!) so when I got this new one comparisons were inevitable. Firstly I am glad this one can be used in the shower, that is a huge benefit because wet hair comes off easily which essentially means less pain. 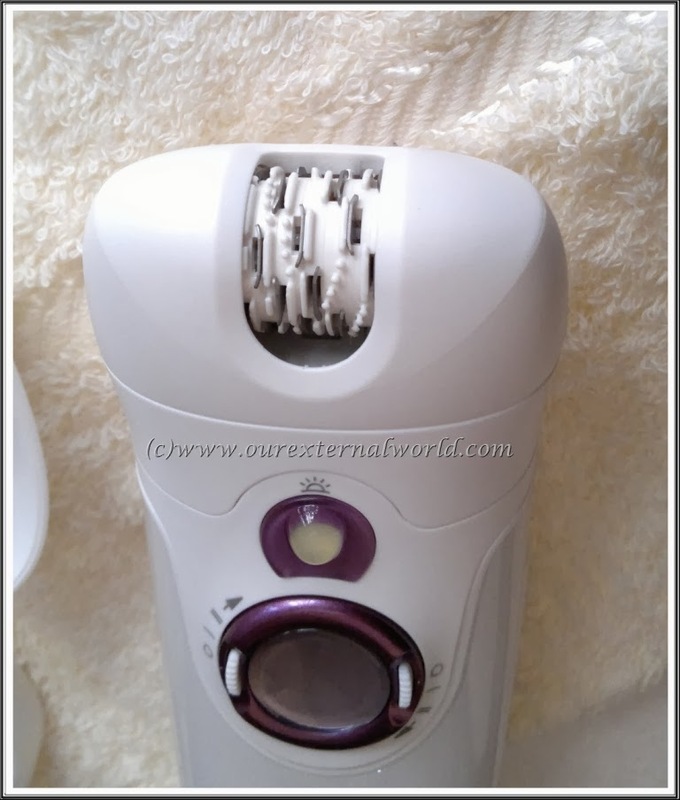 Although I did notice the epilator discharges faster when used in wet mode. So when using in the shower make sure it is fully charged. My old silk epil did not work off a battery and came with a cord which meant it could not be taken to the shower. It also meant that epilation had to be done closer to a power source. The size and shape of the newer Silk Epil 7 is more sleek and hence easier to handle. I tried the facial attachment and tried to do my upper lips. It was very gentle in plucking out the hair and I think this attachment is very useful for beginners. Just make sure you stretch you skin nicely before epilating any part of your skin - particularly the face where the skin is softer. My old epilator did not have this attachment. The shaver is very nice as well though I'm going to keep it away only for occasions when I'm in a hurry and don't have the time to do epilation. 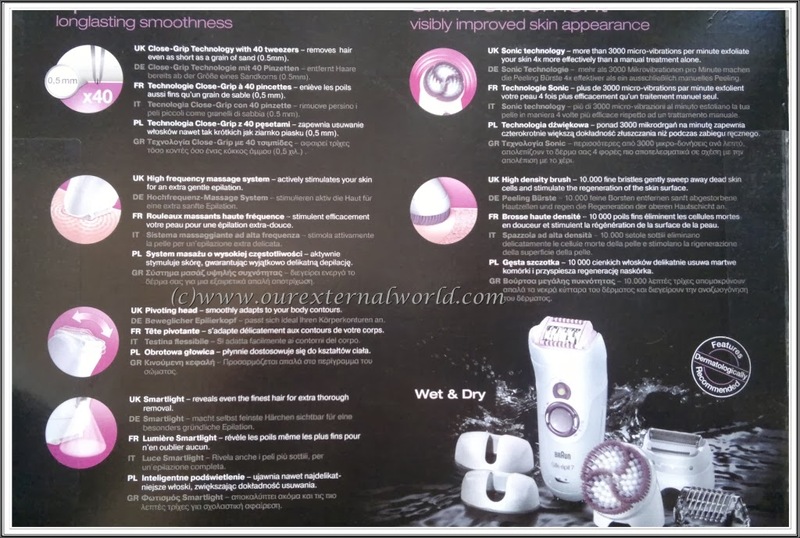 There is nothing I don't like about this product but there are a few enhancements I would suggest to Braun to address in their next Silk Epil version. First is the placement of the light. The Silk Epil has a small light that goes on as soon as you turn the unit on, this is good so that you can see tiny hair on the body and works fine for the legs. But when you are using it on the face the light just doens't fall on the area you are epilating because that area is so small. I'm not sure how much battery this light eats up but I would still prefer an option to turn the light off. Next suggestion is again related to the facial hair removal. It would be a lot easier if there was a seperate smaller epilating head for the face. Right now there is a cap that sits on top of the main epilating head. I think a seperate smaller head would give more control specially for a small area like the upper lips. I hope this epilator lasts me just as long (if not longer) than my previous epilator. 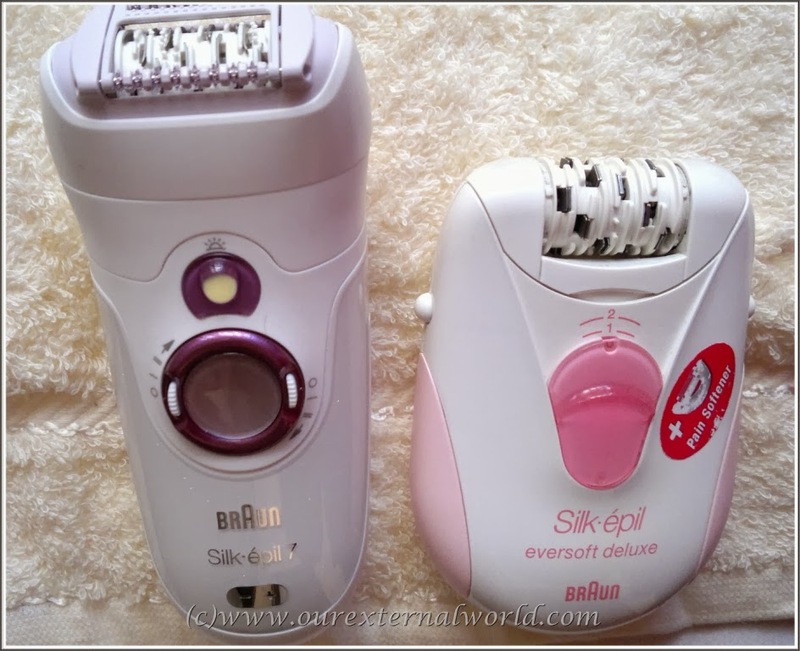 Girls if you are still wondering whether you want to invest in an epilator I'll say Braun is a safe company for investing in epilators. 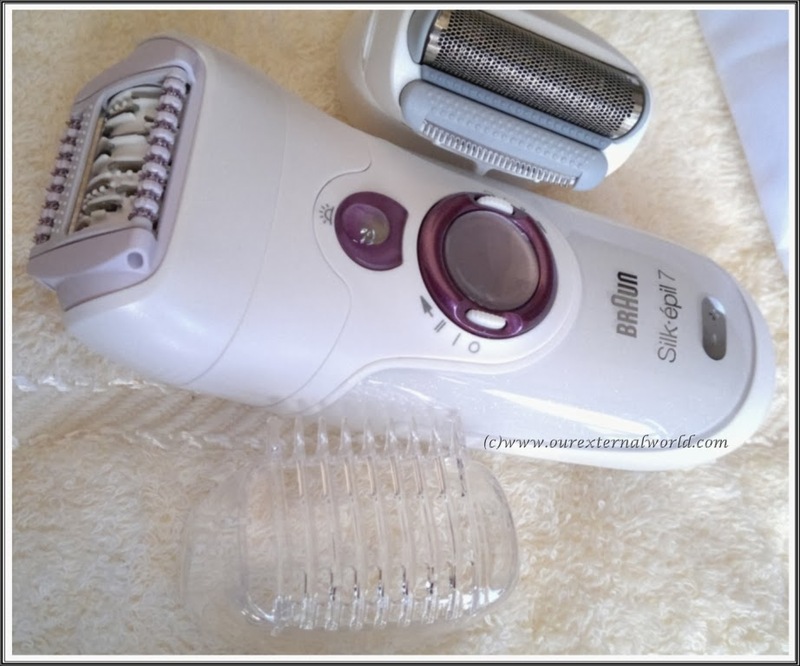 You can chose the epilator that fits your budget. And I'd really recommend epilators specially to girls who are always on the go and have to travel a lot - you'll never regret your purchase. PS: If you have extremely sensitive skin please try and buy this at a shop where they are willing to demo the product to you - my skin is sensitive when I get it waxed and even with epilation sometimes I get bumps but they subside by morning (I prefer epilation in the evening). If your skin cannot take waxing pain or is too senstive then please take an informed decision and do try the product before purchasing it. Loved the detailed review Shilpa, I would love to get my hands on this one soon .. Have you used that brush on face too or its usage is limited to body? thanks Shalini - the brush is not suitable for the face I think. I went through the entire post and loved how much in detail you have written it, it addressed all queries and points about this model. I use the older version and it really pinches. and I dare use the older one on my face and underarms, it really hurts bad then. 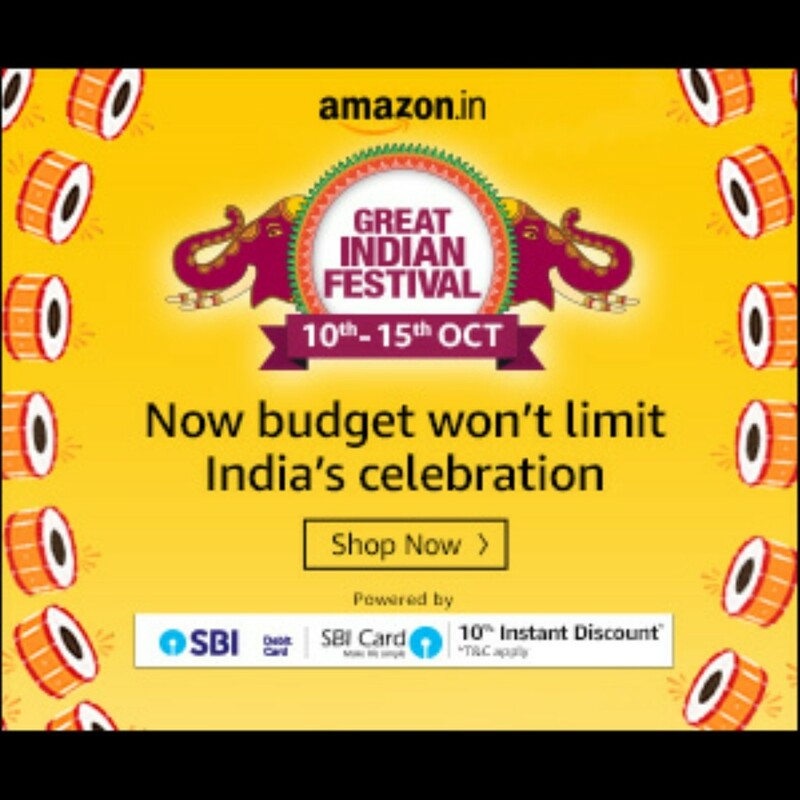 Amazon services and discounts are pretty good! I used to use the Silk Epil in years ago in college but i feel it increases the ingrowths. Does that happen with you as well? All the attachments look amazing too. Will check this out. Following you on GFC. I just purchased it and I also have been using eversoft model before..I have noticed that the new model is much slower in rotation compared to the old model? do you notice the same issue? or just mine is defective? How is the battery life? Does it still last 40 minutes? can it be used for bikini line...nd is it painful there???? it can be used but unless you regularly get your bikini line done I would say it is going to be pretty painful. I have personally not used it for that purpose. Hey I am planning to buy this model so plz tell me if the spa head works well to remove ingrown hairs. ( I really suffer bad from them near the knees). and also the facial cap.. is it really difficult to target the upperlip area? and can i use it for the whole peach fuzz? About the upperlip fuzz - I would not use it there. Better try threading as it removes 101% from folicle. if a hair is not totally removed you can have immence issues. They say do not use on the face on the packaging. About ingrowns - I had that issue on my arms, Now with SE7 they do not appear. thanks for sharing this dear, I will surely try out the mouthwash trick! Can it works with the cabel in charging mode or it works only on battery? 2. If i use it under water while exfoliating, won’t it hamper the performance of the epiliator in the long run…. I love to read your comments. Its great to connect with you here but its my humble request - please do not leave marketing links here. If you would like me to visit your blog just leave a text message instead of hyper links! 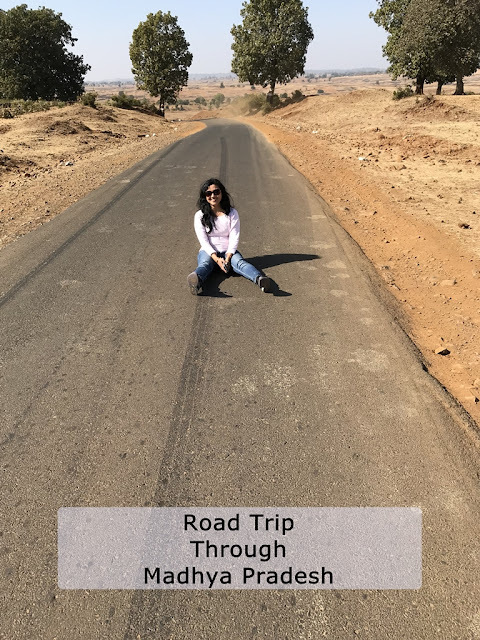 Follow Shilpa Gandotra's board Our External World on Pinterest. Leggings, Jeggings, and Treggings - What's The Difference? All images on this blog are owned by me unless stated otherwise. Please do not copy any content!. Powered by Blogger.